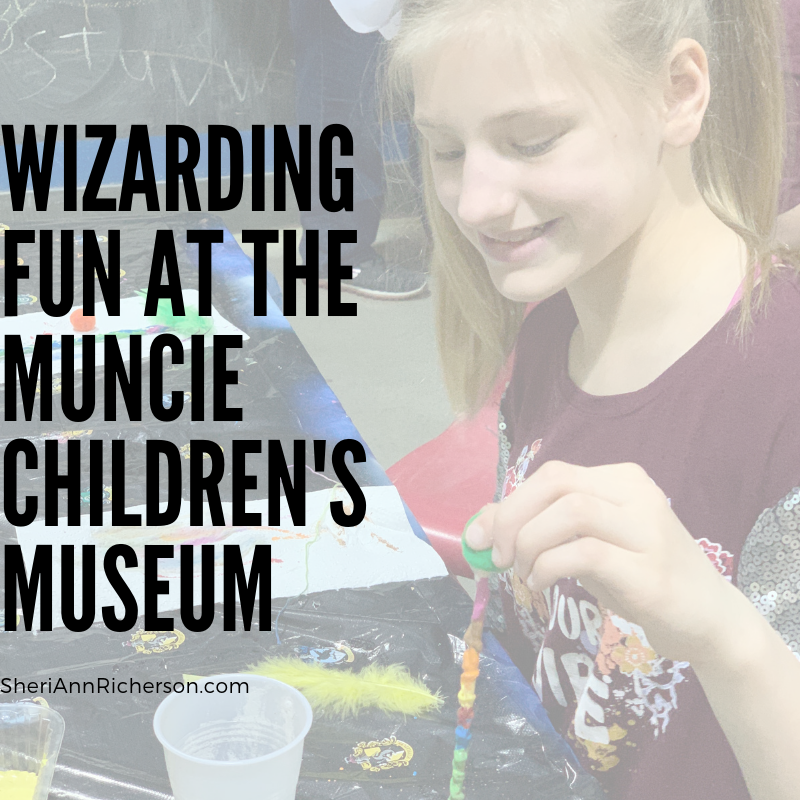 It seems that no matter where you look, it’s Harry Potter and wizards, everywhere, which is why it was no surprise to me that so many children showed up for the wizarding fun at the Muncie Children’s Museum. If you haven’t heard of Harry Potter, you might have been living under a rock for these past few years and I do encourage you to check the movies or books out, especially if you have children in your life. It’s understandable why Harry Potter is such a big deal. The books and movies are top notch and the fan base is one of the most loyal ones out there! My grandchildren are Harry Potter fans, so when my daughter mentioned taking them to participate, I wanted to attend with them. Honestly, I wasn’t sure what to expect as this was the first smaller museum I had been to and so I called ahead to ask if they had a press packet to explain more about this event. 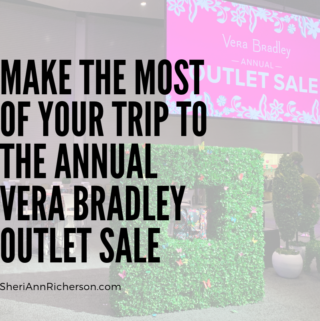 I was told they did not, but there was a small flyer available at the front desk once I arrived. 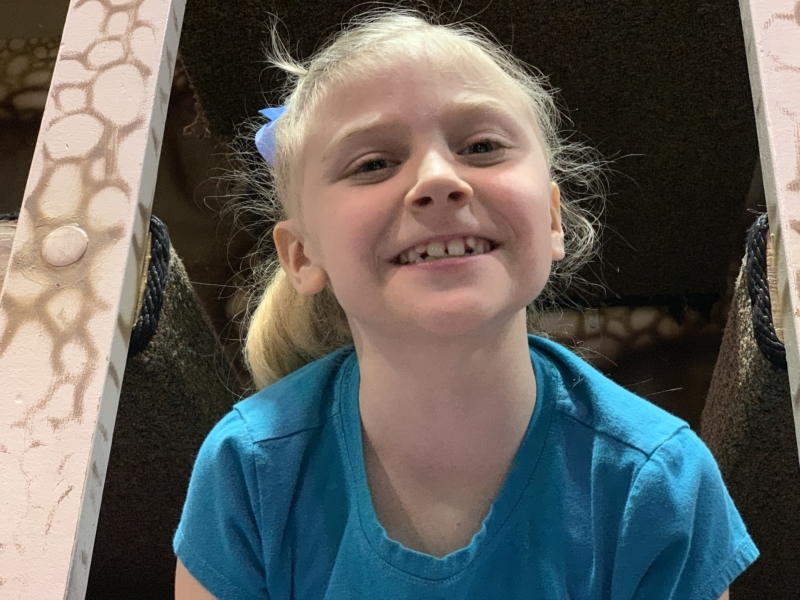 Unlike larger museums where the exhibits are based on historical events, this event was more about letting kids have fun. And trust me on this…we were ready to have fun! 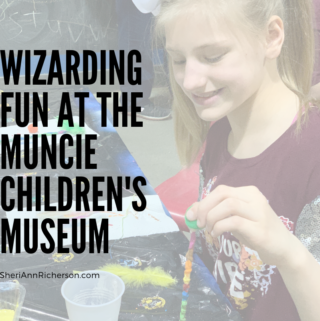 The Muncie Children’s MuseumMuncie Children’s Museum put together some stellar fun activities that kids could participate in during spring break that were Harry Potter inspired. That’s one of the things that makes this museum great. They really do a great job of putting their focus on the kids. 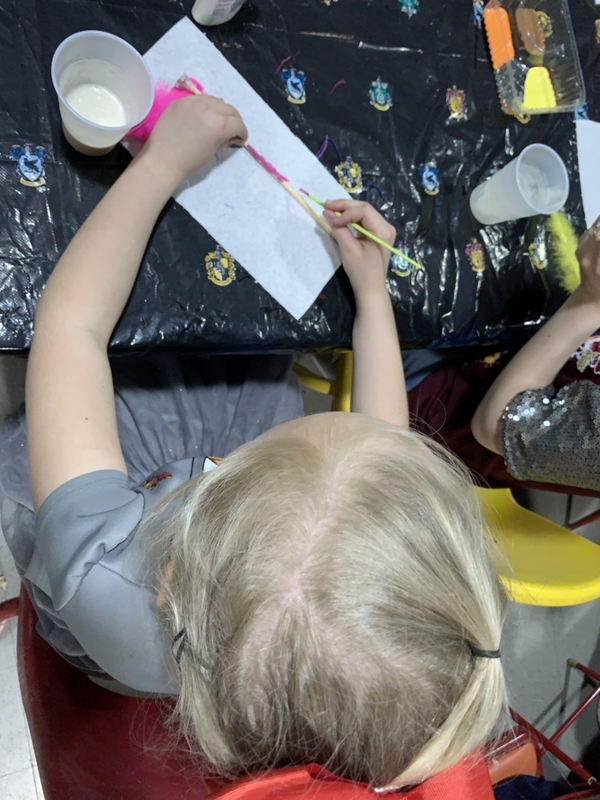 Even though the wizarding fun event was based on characters from a book, the activities that they had put together also encouraged the kids to learn more about Science but in a way that didn’t feel like they were learning. Adults were welcome to join in! I sat on the sidelines and watched as the events were really geared towards kids. 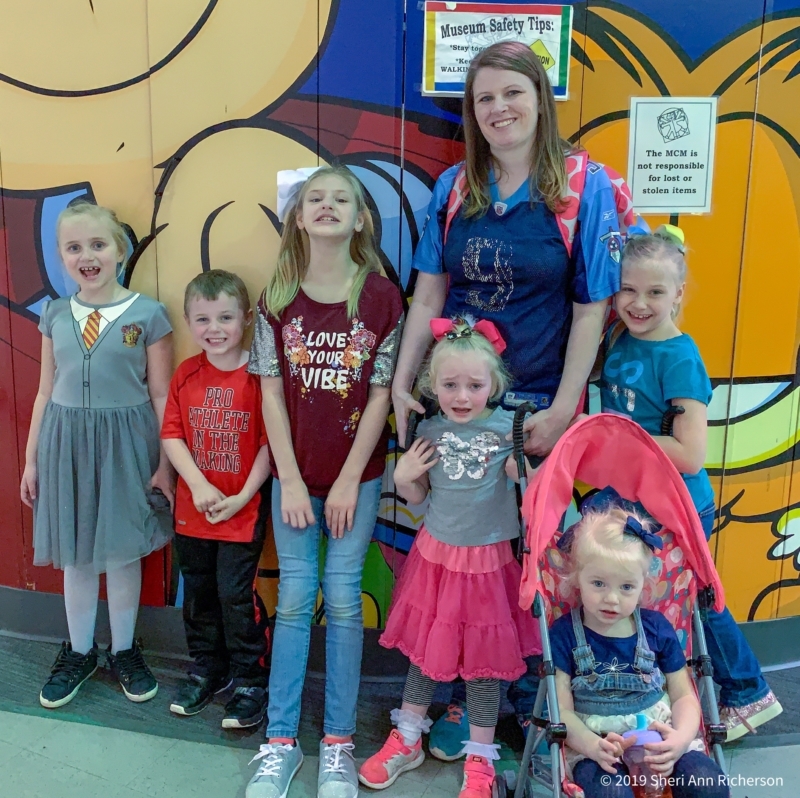 In addition to fun activities such as making your own wizard wand, participating in the Triwizard Tournament and concocting crazy potions, participants were offered their very own cup of Butterbeer. Have you ever tasted Butterbeer? 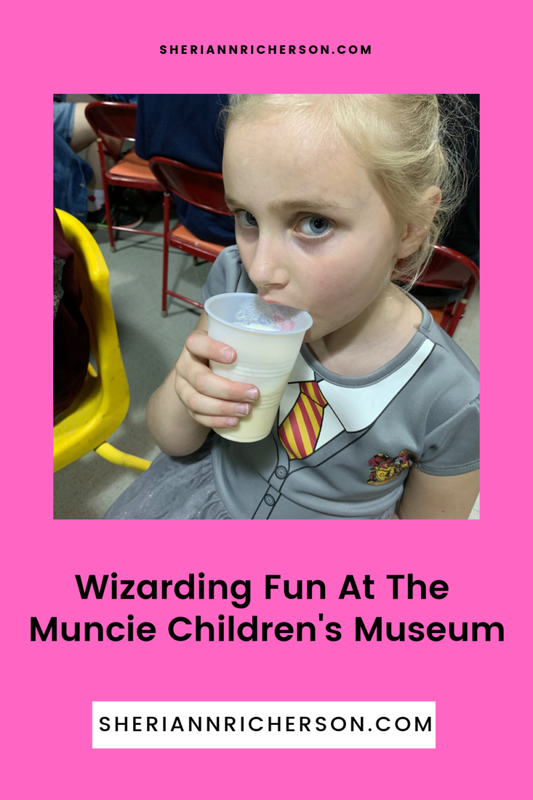 The Butterbeer the Muncie Children’s Museum was made of a mixture of ice, ice cream, cream soda, and butterscotch. It tasted very similar to a cream soda float and everyone who requested a cup of it seemed to enjoy it. When it was offered, every hand in the room went up to receive a cup of this beverage and understandably so! My grandchildren actually stopped what they were doing once they tasted the Butterbeer and concentrated on drinking it before going back to the task of decorating their wand. It was just that good! Not only were their fun exhibits and activities, but one of the most popular ones was being able to create your own wizard wand. Each person who showed up to create their own wizard wand was given a wooden stick with a flat stone on top of it. The stick had a clear rubber band wrapped around it to create dimension. The participants were then asked to pick a seat at one of the three long tables so they could receive further instructions. On the table, in front of each chair, was a piece of paper towel, a colored feather, a piece of string and a colored pom pom as well as a paint brush. As soon as everyone was seated, the instructor preceded by explaining how to create the wand. It was so quiet you can hear a pin drop. Each table had a glass of water on it and various colors of paint in small dishes as well as a bottle of glue. Everyone was then given instructions on how to make their wizard wand. First paint the wand whatever color or colors you choose. Be sure to rinse the paint out of the paint brush by swirling it in the cup of water, tapping the paintbrush on the side of the cup to shake off any excess water, then touch the paintbrush to the paper towel to dry it. Do this when you want to change paint colors as well as when you are done painting. Glue the pom pom to the flat stone on top of the wand. This takes patience as the Elmer’s Glue they used was slow to adhere the pom pom to the stone. Tie the string around the feather and then tie the string around the wand. Lay the wand on the paper towel and allow the paint and glue to dry before using it. 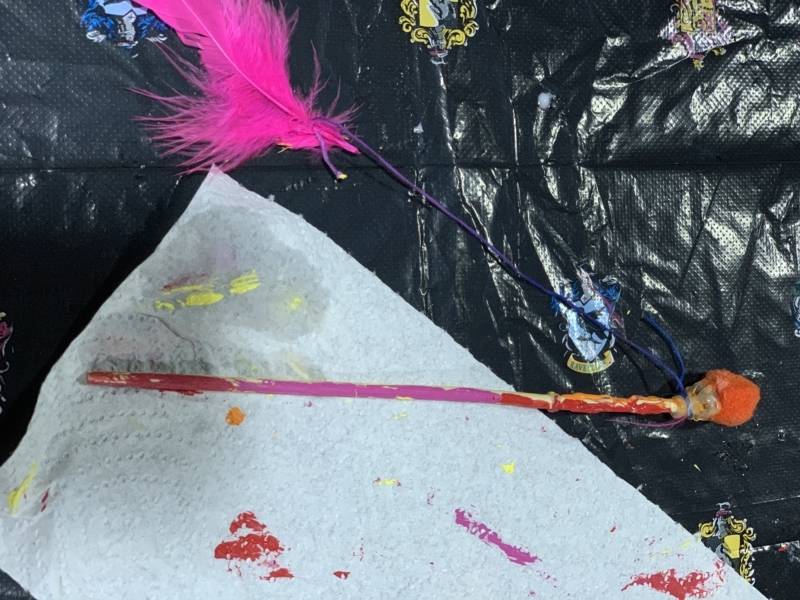 Once the paint and glue are dry, the wizarding wand is ready to use! 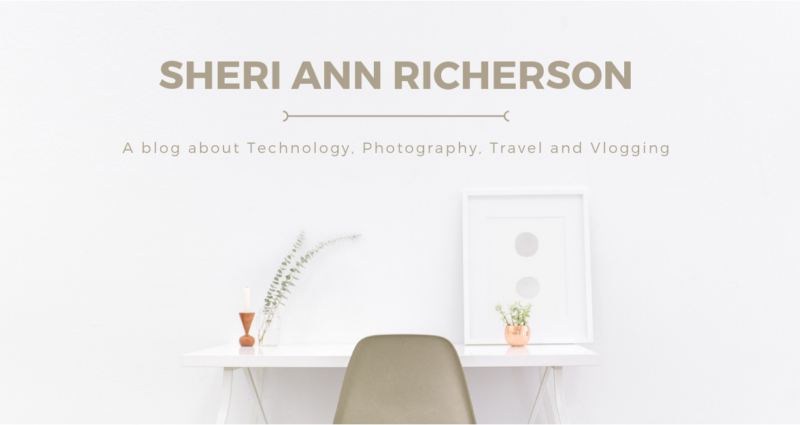 It was seriously cool to make! This was the only activity we were able to participate in because we arrived too late to participate in the first activity of the day and did not stay long enough to participate in the last activity of the day. But for those who arrived earlier than us or stayed later than us, two other activities were offered to complete. One other really cool aspect that the museum focused on was allowing the kids to make their own crazy potions. Of course, this was more about following directions and creating with safe additions, but it was still really cool to see and watch. Not only were the kids excited about making their own potions but you could actually see their imaginations at work as well! It was fun to see kids being kids and in their creative element. The Triwizard tournament was the true test for Harry Potter fans. Packed full of information and questions about Harry Potter, wizards and magic, every contestant gave their all in trying to be crowned the winning wizard! While we didn’t participate, we had a blast seeing others do so! 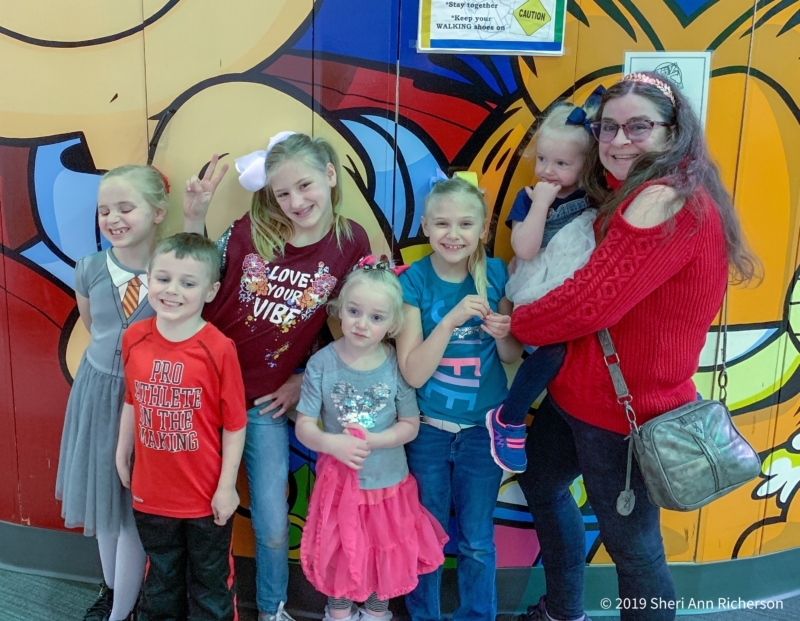 Our time at the Muncie Children’s Museum was so much fun. With all the activities that were offered, it made a huge impact on the grandkids and how they viewed science. They were excited to explore all the various areas and crafts and have still been talking about it since it happened! Of course, when it came time to leave, the kids were not real happy because they had so much fun they weren’t ready to go home, but they were getting tired and it was time for them to eat. We can’t wait to see what other fun events the museum will be offering for kids and we do plan to take them back for another fun filled day real soon! 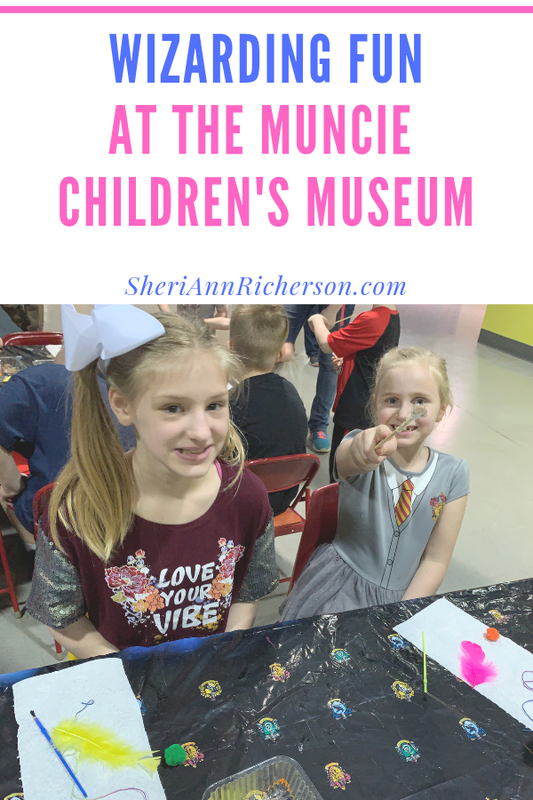 I want to encourage you to check the Muncie Children’s Museum out and take your kids or grandkids for a visit!